Up until now, when readers of Alexandre Dumas’s The Count of Monte Cristo have turned the last page, the story has ended, leaving them feeling somewhat deflated. Now, thanks to a mysterious writer, readers no longer have to live with this sense of loss. A writer, known only as “Holy Ghost Writer”, continues the adventure with The Sultan of Monte Cristo. Even better, readers can’t beat the price on the continuation of their favorite story: the .Mobi and .EPUB versions can be downloaded directly from www.sultanofmontecristo.com/buy-the-book.html for $0.01, or purchased through their favorite retailers: Amazon Kindle $0.99 and Barnes and Noble Nook $0.99. Traditional softcover is available through most retail book stores at $7.77. For anyone who is a fan of Dumas’ works, The Sultan of Monte Cristo is the perfect read, bringing the adventure and spirit of the author back to life. Once Holy Ghost Writer reveals his/ her identity, he/ she is certain to become a favorite among lovers of classic adventure novels. 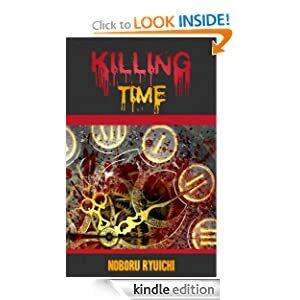 Noboru Ryuichi’s ‘Killing Time’ is a fast-paced thriller set in 2136, when both the civilian and prison populations have spawned out-of-control, leaving the prison system to turn to time travel. Unfortunately, one cunning serial killer figures out how to use time travel to further his own agenda. Society may have survived the end of the Mayan calendar, but potential disaster may still loom in the future. Author Noboru Ryuichi’s science fiction thriller, Killing Time, paints an unsettling picture of 2136 that may be fiction, but has roots in some very real, non-fiction problems that society needs to address, including overpopulation and an overcrowded prison system. In Killing Time, both have grown exponentially, and the situation is out-of-control. Although prisoners had been sent to deserted islands leading up to 2136, this solution is no longer possible. Thanks to medical advances, people are living longer and reproducing more. Every square inch of land has been claimed by the population, including the deserted islands. In order to address the problem, the prison system must seek unique solutions to their threatening problem. They begin using time travel to send special officers back in time to determine which event in their lives sealed their fate and set them on a path of criminal behavior and attempt to alter their path, precluding them from becoming prisoners. At first, this solution works well for them. Unfortunately, one prisoner sees it as a way to further his evil ends. The world’ most notorious serial killer, Timothy Duvey, begins manipulating time travel. Now, Special Officer Laden Kinkaid is charged with the task of locating Duvey and returning him to 2136. If he fails, Duvey potentially stands to take over the world. It is a fast-paced thrill ride that readers will find impossible to put down. What makes the story even more compelling is its roots in problems that society will, undoubtedly, face in the future, if the general population and prison population continue to grow. For anyone who enjoyed Minority Report, Killing Time is a must-read. Killing Time is Noboru Ryuichi’s first novel. He has written several short stories. In writing this book, he decided to fuse his love of storytelling, science fiction, and the idea of time travel. A native of Osaka, Japan, he now lives in Edmonton, Canada. For anyone who appreciates the Gonzo journalism of Hunter S. Thompson or the style of Quentin Tarantino’s character-driven crime plots comes a new novel from up-and-coming author James Robb. The 20-year-old wunderkind’s most recent novel, Achieving the Golden State, tells the story of four friends on a road trip to California. The story of Shannon Parke, Luca Romano, Bruce Maxwell, and Kurt Darling is part of a five-book series, the “True Light Chronicles”—stories of how young, militant hippies are drafted into the adventure of a lifetime. The band of young men are on a journey to discover the roots of their murdered friend’s ideology. It is no typical Kerouacian trip to the West: Shannon’s fate becomes tied to the universe through a dark gift and they become entrenched in an invisible war. Egos clash when the broad range of personalities collide on the road. In their travels, the group encounters a secret society of Mormon college students with morals that are less-than-noble, a witch doctor, and many others, making it an adventure that neither they, nor readers, will soon forget. In the meantime, the seemingly unrelated story of another young man, who is caught up with a cartel and a biker gang unfolds. Their fates are inextricably intertwined. It is a decidedly adult book (think Tarantino-esque dialogue and themes), despite the younger ages of the characters and of the author. Though he may be young, James Robb’s deft ability for rendering an unforgettable story far surpasses his years. Even better: James Robb is offering readers free copies of both Achieving the Golden State as well as offering copies of Corona Rapture. In order to request free copies, interested readers may indicate interest in one or both books in their message by sending an email to dbijamesr@gmail.com or by using the coupon code WF53E to download Achieving the Golden State free from its Smashwords page as a PDF or for Kindle (.mobi), E-pub, etc. Readers will, undoubtedly, be anxious for the next installment in the “True Light Chronicles”. James Robb is a 20-year-old YA fantasy writer. His interests include theoretical physics, bio-technology, and recording music as his fictional character Artemis under the name Sun Kingship Reprisal (SKR). Connect with James Robb on GoodReads at http://www.goodreads.com/author/show/3974202.James_Robb. A decade in the writing, Dean Davis’ The Test: A Seeker's Journey to the Meaning of Life is an exhilarating spiritual journey and a true intellectual feast. In essence, this book is a systematic exposition and defense of the biblical worldview. Keenly aware of the growing skepticism of postmodern man, Davis reaches out compassionately to seekers of every kind, endeavoring to rekindle their desire for spiritual and religious truth, and also to assure them that it can indeed be found. The result is a book that will strengthen the faith of believers, even as it challenges seekers and skeptics alike with beauty, power, and reasonableness of the biblical worldview. This work is complex and ambitious, yet highly readable. Careful not to assume any prior knowledge of Christianity, Davis meets his reader at “base camp” and invites them to take a logical, step-by-step journey through all sorts of fascinating intellectual terrain: philosophy, apologetics, theology, and comparative religion. A brief overview may incline you to join him. Part One (Life: A Mess or a Test?) is philosophical. Here, Davis skillfully shows that man, by his very nature, both desires and is equipped for a pursuit of spiritual truth. He concludes that that our life is indeed a test set before us by an "Unknown God," and that the deepest meaning of life is to pass it! Part Two (In Search of the Teacher) is devoted to Apologetics. Davis' goal here is two-fold. On the one hand, he explains why nature, conscience, science, philosophy, and mysticism cannot provide trustworthy answers to life's ultimate questions. On the other, he shows that the Unknown God has graciously supplied those answers through his two appointed Teachers—Christ and the Bible. He also shows how God has blessed us with an astonishingly diverse and powerful body of evidence to prove that those Teachers are the real deal! In Part Three (The Teacher on the Questions of Life) Davis seats his reader at the feet of Christ to ponder his answers to the nine great questions of life, questions that provide the proper framework for any viable worldview. In presenting us with Jesus’ answers to these questions, Davis does not ignore common objections, but tackles them head on, illustrating the profound reasonableness of the biblical worldview. In Part Four (The Teacher on the Test) the author brings the journey to its climax, asking if Christ did indeed view life as a test, and If so, how can we pass it. This section also includes the hair-raising story of Davis' own arduous search for spiritual truth, a story that should much encourage struggling seekers everywhere, especially those involved in Eastern Religiions. Recognizing the challenges of this ambitious a journey, Davis has gone to great lengths to ease the way. In particular, he has lavishly supplemented the text with charts, tables, diagrams, memorable anecdotes, creative illustrations, relevant quotes, extensive endnotes, and a rich bibliography. It is clear that The Test is Dean Davis' magnum opus, his best effort to distill years of study and ministry into a winsome, respectful, God-honoring exposition and defense of the biblical worldview. I would encourage all who read this review to take The Test . . . and to pass it along!